And that’s taking this time as an opportunity to improve on your investing skills. Like the saying goes, strike while the iron is hot. That being said, there are many investing strategies that retail investors can use. Veteran investor and educator, Dr. Tee will explain, breakdown all the strategies and reveal his 11 critical FA criteria that he always uses to identify giant stocks, in a simple and easy to understand way. He will also demonstrate how exactly to screen good stocks globally. 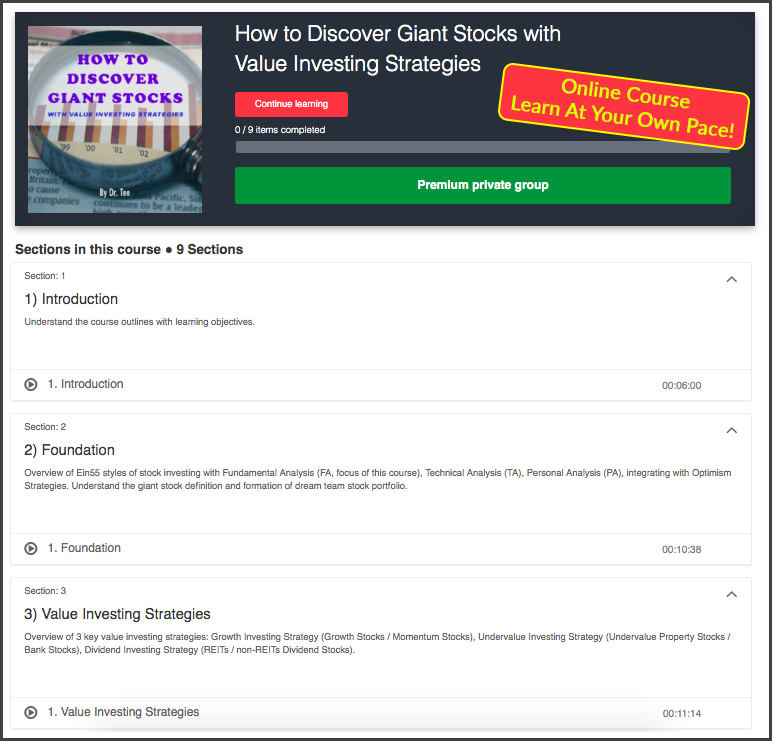 This is all in one of the best-selling online courses available on our marketplace, where you will learn How to Discover Giant Stocks with Value Investing Strategies. This is the online course to take for beginners to get a sense of the different strategies and how to pick stocks to build a strong portfolio – all in just under 2 hours over 9 learning modules! The instructor for this online course is Dr. Tee Tong Yan, who holds a PhD specialized in computational simulation. He possesses 20 years of trading/investing experience with in-depth knowledge in stocks and various major investment markets. He was a corporate Vice President, now the founder of a consulting firm. He is a well sought after speaker in major trading firms and various investing seminars. Dr Tee has trained over 20,000 students (4hr stock investment course) and over 2700 graduates (5-day course). ✔ Beginners and intermediate learners who wish to form a dream team stock portfolio which is fundamentally strong in a systematic way step by step. ✔ Stock investors are interested to learn what stocks to buy for medium term and long term investing, aiming both for incomes (collecting dividends with REITS and non-REITs) and capital gains (appreciation of share prices). ✔ Those who are interested in acquiring Dr. Tee as a mentor, with his personal guidance and support through the private discussion group included. This course has been highly rated and over 300 people have bought this online course and acquired Dr. Tee as a mentor! See all reviews here. Take action, get full-lifetime access to this online course and have Dr. Tee as a mentor for only $25 today! So that the next time the market runs up again (or down), you’d know exactly what to do.